Walking, in particular hillwalking, but also beachwalking, is one of my favourite activities on Islay. A very nice walk is the walk up Beinn Bheigier, or Ben Vicar in the Anglicised name. I walked up Beinn Bheigier during WalkIslay 2005, for some better views I also created two panoramas, a QuickTime VR panorama of the view north and east from Beinn Bheigier and a QuickTime VR panorama of the view over Ardtalla. We didn't have as good visibility during the walk as Paul seems to have had, but the views were still very nice. 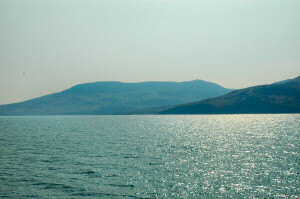 Oh, and the picture above is a view of Beinn Bheigier from the ferry. McArthur's Head in the foreground, then Proaig Bay and the big long bulk of Beinn Bheigier in the centre of the picture. The summit at 491m is on the right side, the other top is lower at 456m.